Have you ever walked into a hotel, restaurant, store, etc. and been greeted with graveyard silence? The experience is uncomfortable and somewhat intimidating, you feel like the focus is on you and every move you make is being watched. It can be a massive deterrent to customers, who will simply look elsewhere for a more inviting and comforting atmosphere. Research found that retailers that played background music in their store had happy shoppers who stayed 18% longer and made 17% more purchases*. When used correctly, music can be an incredibly powerful tool for businesses. Gone are the days where music was managed by the business owners and or their staff, and used for just background noise; nowadays smart businesses use music to enhance their customers experience, their brand/image, and increase footfall and sales. Here we take a look at the ways you can measure the effectiveness of the music you play and optimise it to achieve the desired end results. If a business makes the transition from having no music, to having music, that music becomes an extension of the businesses brand/image; another medium and sensory experience that can influence the customers perception of the business. It’s therefore important that the music you’re playing is aligned with your businesses brand/image and customers. Music is not tangible. You can’t eat it or drink it, and it doesn’t protect us against the rain, wind or cold. But we love it, and our brains can do some pretty amazing things when it comes into contact with it. Check out our Music and the Brain infographic below to see some of the fascinating effects music can have on our brains! 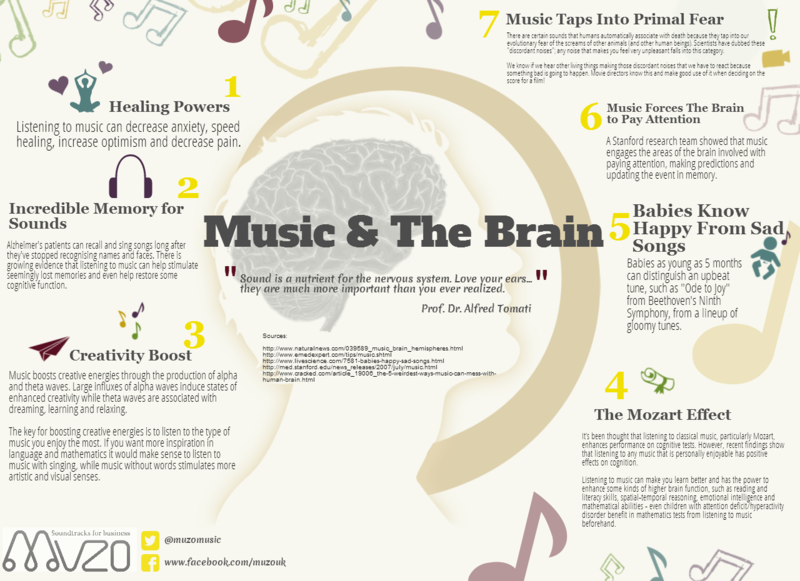 We hope you liked our infographic, and you now have loads of knowledge about the effects of music and the brain. Head over to our Twitter and Facebook pages and keep up-to-date with all our other muzings!